With an estimated construction cost of $665M and a five year build time, the Large Synoptic Survey Telescope (LSST) received approval from the National Science Board and is headed to the final design stage. With approval from the National Science Board, the National Science Foundation (NSF) Director will advance the Large Synoptic Survey Telescope (LSST) to the final design stage. This action permits the NSF Director to include funds for LSST construction in a future budget request. To be located in Chile, the LSST is a proposed 8-meter wide-field survey telescope that will survey the entire sky approximately twice per week, delivering a large and comprehensive data set that will transform astronomical research. 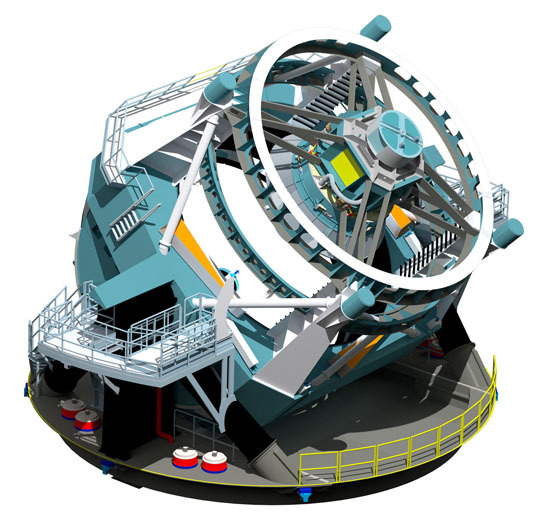 The LSST was the first-ranked ground-based large initiative in the 2010 National Academy of Sciences decadal survey in astronomy and astrophysics. The project is a partnership among the NSF, the Department of Energy (DOE) and a number of private contributors. Equipped with a 3-billion pixel digital camera, the LSST will propel astronomy ever further into the era of data-enabled science. By charting objects that change or move, and tracing billions of remote galaxies, LSST will provide multiple probes of the mysterious dark matter and dark energy, provide insight into short-lived transient events such as astronomical explosions or collisions, and create a more detailed map of the Milky Way and our own solar system. NSF and DOE have recently signed a formal Memorandum of Understanding delineating the scope of the agencies’ responsibilities throughout the lifetime of the project. NSF will be responsible for development of the site and telescope, as well as the extensive data management system. DOE, through a collaboration led by its SLAC National Accelerator Laboratory, will be responsible for development and delivery of the large-format camera. The Republic of Chile, through an agreement with Universidad de Chile, will make available the observing site for the LSST telescope. The total construction cost of LSST is estimated to be about $665M, approximately 70 percent from NSF, 24 percent from DOE, and 6 percent from private donors to the project. The construction is anticipated to last five years, followed by a two-year commissioning period before the start of the survey. Be the first to comment on "Large Synoptic Survey Telescope Headed to the Final Design Stage"